Abraham Lincoln (February 12, 1809 - April 15, 1865) was the 16th (1861-1865) President of the United States, and the first President from the Republican Party. His accomplishments include successfully restoring the federal unity of the nation by defeating the secessionist Confederate States of America and along the way, played in an important role in ending chattel slavery in the United States. Born on February 12, 1809, in Kentucky, he moved at a young age to the area near Springfield, Illinois. He served as a captain in the U.S. Army during the Black Hawk War. He later tried his hand at several business and political ventures which all proved unsuccessful. It is widely believed that Lincoln suffered from bouts of severe depression, a theory supported by Lincoln's own statements and reports of the young lawyer's spending days alone in bed. It is also suggested that Lincoln may have suffered from Marfan syndrome, a disease which results in an elongated figure and bone structure. Lincoln eventually married and raised a family with Mary Todd Lincoln, who had some psychological difficulties of her own and at times required almost constant attention. Mrs. Lincoln generally disliked politics, and her tenure as First Lady was marked with some scandal as she spent lavishly to redecorate the White House and reportedly purchased an inordinate amount of hats, gloves, and other fashionable items of clothing. Todd's family were slave owners from Kentucky, and her brother fought for the Confederacy. First elected to the House of Representatives, Lincoln spent most of his time in Washington, DC alone and made less than a spectacular impression on his fellow politicians. During his unsuccessful campaign for the United States Senate against Stephen A. Douglas, it was Lincoln's well-known gift of oratory that brought public support to an otherwise unimpressive candidate. Lincoln debated Douglas in a series of events which represented a national discussion on the issues that were about to split the nation in two. The Lincoln/Douglas debates marked Lincoln's presaged the Presidential election of 1860, in which Douglas and Lincoln were once again opponents. Shortly after his election, the South made it clear that secession was inevitable which greatly increased tension across the nation. President-elect Lincoln survived an assassination attempt in Baltimore, Maryland and on February 23, 1861 arrived secretly in Washington, DC. The South ridiculed Lincoln for this seemingly cowardly act, but the efforts at security may have been prudent. At Lincoln's inauguration on March 4, 1861, the Turners formed Lincoln's bodyguard, and a sizable garrison of Union troops was always present, ready to protect the president and the capital from rebel invasion. During his presidency, Lincoln is credited with freeing the slaves with the Emancipation Proclamation, though this only freed the slaves in areas of the Confederacy not yet controlled by the Union. However, the proclamation made abolishing slavery in the rebel states an official war goal which became the impetus for the enactment of the 13th and 14th Admendments of the United States Constitution which respectively abolished slavery and established the federal enforcement of civil rights. 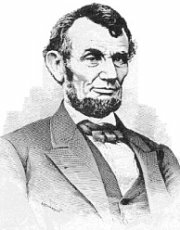 During the Civil War Lincoln held powers no previous president had wielded; he suspended the writ of habeas corpus and frequently imprisoned Southern spies and sympathizers without trial. He showed tremendous leadership to the Union populace during the war as evidenced by the Gettysburg Address, a speech dedicating a cemetery of union soldiers from the Battle of Gettysburg in 1863. While most of the speakers at the event spoke at length, some for hours, Lincoln's few choice words resonated across the nation and across history, defying Linoln's own prediction that "The world will little note, nor long remember what we say here." While there is little documentation of the other speeches of the day, Lincoln's address is regarded as one of the great speeches in history. The war was a source of constant frustration for the president, and it occupied nearly all of his time. After repeated frustrations with General George McClellan, Lincoln made a fateful decision to replace him with a radical and somewhat scandalous army commander: General Ulysses S. Grant would apply his military knowledge and leadership talents to bring about the close of the Civil War. When Richmond, the Confederate capital, was at long last captured, Lincoln went there to make a public gesture of sitting behind Jefferson Davis's desk in Davis's own chair, symbolicaly saying to the nation that the President of the United States, and the U.S. constitution, held authority over the entire land. He was greeted at the city as a conquering hero by freed slaves whose sentiments were epitomized by one admirers quote, "I know I am free for I have seen the face of Father Abraham and have felt him." The reconstruction of the Union weighed heavy on the President's mind. He was determined to take a course that would not permanently alienate the former Confederate states. Lincoln met frequently with Grant as the war ended. The two men planned matters of reconstruction, and it was evident to all that the two men held one another in high regard. During their last meeting, on April 14, 1865, Lincoln invited General Grant to a social engagement for that evening. Grant declined (his wife was not eager to spend time with Mary Todd Lincoln). Without the General and his wife, the Lincolns left to attend a play at Ford's theater. The play was Our American Cousin, a musical comedy. As Lincoln sat in the balcony, John Wilkes Booth, an actor and Southern sympathizer from Virginia, aimed a single-shot, round-slug pistol at the President's head and fired. He shouted "Sic semper tyrannis!" (Latin: "Thus always to tyrants" and Virginia's state motto) and jumped from the balcony to the stage below, breaking his leg in the process. Booth managed to limp to his horse and escape, and the mortally wounded president was taken to a house across the street where he lay in a coma for some time before he quietly expired. Booth and several of his companions (some of whom were later shown to be innocent) were eventually captured and either hanged or imprisoned. Lincoln's body was carried by train in a grand funeral procession through several states. The nation mourned a man who, they realized in his absence, was the savior of the United States and protector and defender of what Lincoln himself called "the government of the people, by the people, and for the people." One of the most respected and beloved presidents, Lincoln has been memorialized in many city names, notably the capital of Nebraska, with the Lincoln Memorial in Washington, D.C., and on the U.S. $5 bill and the 1 cent coin. On February 12, 1892 Abraham Lincoln's birthday was declared to be a national holiday in the United States. USS Abraham Lincoln was named in his honor.